For many years I explored a range of topics that might be considered as occult studies. From astrology to tarot to alchemy I got rather lost down the rabbit hole as I hopped around from one fascinating subject to the next. What I have learnt in retrospect is that all the while I had been searching for the stories. When I looked at astrology I was seeking out the characters, the gods and goddesses that hid amongst the stars, and finding ways to connect them in order to tell a story. Using tarot allowed me to explore symbolism and learn about how symbols are interpreted in different cultures and times. Always I was seeing the occult through the lens of myth and folklore and when I study those things now I realise that my occult knowledge is of great benefit. Not because I want to read fortunes, but because when we seek to understand and to tell stories, we find that there are patterns in the world and that with time and patience we begin to gain an innate understanding of how things are likely to unfold. For those of you who may be just beginning to explore some of these topics, I though it may be helpful to put together a list of books and websites that I would recommend based on my own experiences. Please don't hesitate to comment if you have questions, I'm more than happy to help if I can. Astrology is a vast subject and it's hard to know where to begin. Most people believe astrology is the sun sign columns that appear in newspapers and talk about being a 'Virgo' or a 'Pisces' as if that defines their character. In reality, astrology is a complex system of divination and has evolved over time so that today there are myriad approaches and styles. Western astrology can be approached as psychological, archetypal, esoteric or traditional. In fact recent times have seen a resurgence of interest in traditional and medieval astrology. And there is also Vedic astrology, Chinese astrology and many indigenous forms. So, where to begin? Deborah Houlding's Skyscript Astrology site probably has everything you could ever want to know about astrology. She is particularly interested in traditional astrology and her book The Houses: Temples of the Sky was one of my favourites. When I was learning about tarot I had a particular interest in the history and symbolism of the cards. I found that this provided a great base for understanding the system. At the time I was an active participant in the Aeclectic Tarot Forum which is sadly no longer operating. Fortunately the forum archives have been retained and can be visited here. There is a vast amount of knowledge and information there for those interested. From history, to divination, to sample readings, discussions and more, I would highly recommend exploring. Since the Aeclectic forum closed a range of other forums have popped up and may be worth looking at. When it comes to books, these are the ones I suggest. Huson is a wonderful scholar and writer on tarot. His book combines theories on the history of tarot and brings them through to the modern day with a compilation of different meanings for the cards. While I may not agree with everything he say, it is still probably the single best book on tarot ever written in my opinion, and a great starting place. Robert Place is both an author and artist and has written extensively as well as creating several tarot decks. This book brings together his theories on the origins of tarot and suggests a neo-platonic basis for the cards. There is a lot to be learnt in these pages about neo-platonism as well as tarot and Place's style of writing is easy to read. He is the creator of the Alchemical Tarot, Tarot of the Sevenfold Mystery, The Buddha Tarot, Tarot of the Saints and several oracle decks. Anything written by Place is worth reading and you can explore more of his work at his website. If you are going to work with the Thoth deck, this book really is a must have. Sure, Crowley's own Book of Thoth is the guidebook for the deck, but for those new to the art of tarot and occult studies, it can seem impenetrable. DuQuette writes with clarity and lays the foundations for understanding both Crowley's deck and the worldview that was behind it. Widely considered to be one of the worst tarot books ever written, Arrien's book actually has quite a bit to offer those interested in mythology, symbolism and occult studies more broadly. Criticism comes from the use of card images from Crowley's Thoth deck and the fact that Arrien's interpretations are manifestly incorrect for those wishing to follow the deck as Crowley intended. However, as an anthropologist she takes the approach of combining symbolism, myth, cultural knowledge and psychology in ways that are rather interesting. If approached with this knowledge, there is a lot of good stuff available in these pages. Other authors I respect a great deal are Mary K Greer and Rachel Pollack. 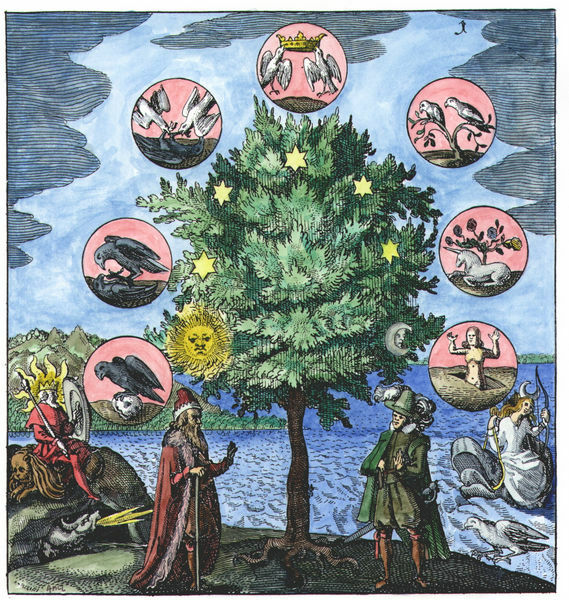 I would highly recommend Adam McLean's Alchemy Website for those interested in alchemy, alchemical art and symbolism or esoteric art or occult studies or well, just have a look. It's AMAZING. I was never particularly interested in Qabalah but Lon Milo DuQuette's Chicken Qabalah is hands down the best introduction to the subject. It is written for those primarily interested in working with Crowley's tarot but for a quick and very humorous orientation I'd definitely recommend it. I hope this little summary has been helpful. I'll update this post if I think of anything else.